Are there “windows of time” for some things in life? One of my yoga students, a runner/marathoner, hypothesized that most people’s bodies can tolerate long-distance running only for two or three decades. Those who run hard from teens to 40s often aren’t running past 50. Those who start later often continue later, but within similar extents. I recalled our chat when I read “The Runner,” by Jordan Conn, ESPN. 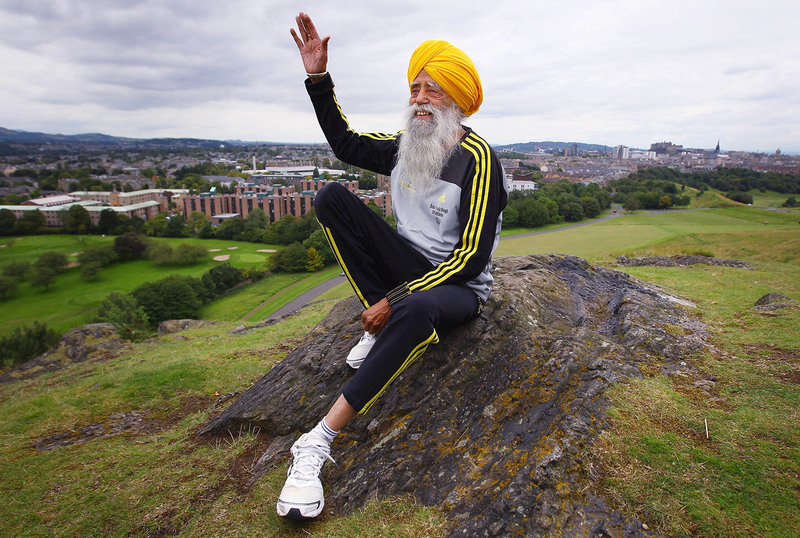 Fauja Singh began running upon moving to London at age 84. 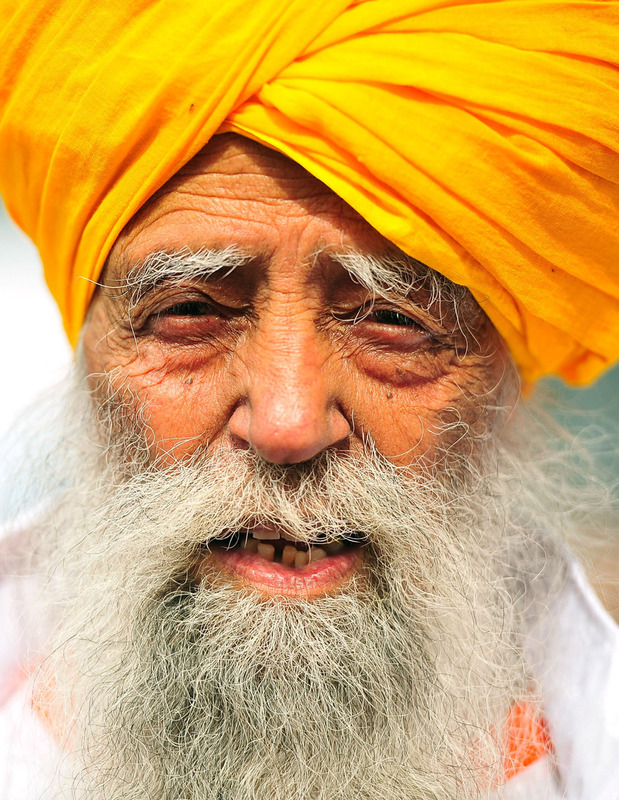 Born in northwestern India on April 1, 1911, he had lived simply, as a farmer in his home village, for eight decades. Among his three sons and three daughters, only one son, Kuldip, remained at home. After his wife died in 1992, he expected to spend his remaining days working the fields and laughing over tea with his son. When running, Fauja realized he thought only of his next step. After enough steps, his mind went blank, and with his feet pounding the pavement, Fauja says, “I felt connected to God.” The anger evaporated. For at least a few moments, Fauja escaped his grief. One day, he saw a marathon on TV. If those people can do it, surely he could! In 2000, he ran his first marathon at age 89. The next year, he ran the London Marathon and became the fastest man over 90 to run a marathon. By his 100th birthday, he’d broken other distance-running records for men over 100, but he wanted the Guinness World Record for oldest male to complete a marathon. In October 2011, he finished the Toronto Marathon at age 100, two years older than the official record holder. Unfortunately, he has no birth certificate, which weren’t given to Indians under British rule in 1911. And Guinness requires birth certificates as evidence. Today he is 102, and he ran his final race (a 10K in Hong Kong) in February. Is there a yoga “window of time”? Patanjali’s eight-limbed yoga is multi-dimensional, and one can focus on different limbs at different stages of life. A typical assumption is that we shift our focus from asana to “higher” limbs over time. That said, asana can be done at any age, if modified accordingly. The yoga window is long, as long as a lifespan for some. Maybe anything is possible at any age. (Almost.) Take Singh and running: His marathon times can’t compete with a young man’s, and his running career cannot span decades. Nevertheless he underwent the same “arc,” from incline to peak to decline. His marathon times improved between 89 and 92! Who’s to define the “best” time for any arc to occur? Certainly, we’d all run our fastest marathons from youth to middle age, not in our 90s. Likewise, in asana, one’s arc has a different flavor if it runs from 25 to 45 versus from 30 to 80. But is one experience necessarily superior? I once read a senior yoga teacher describing how handstands came naturally to her, but in her 60s they became incongruously challenging. Around the same time, one of my yoga students, sturdy and athletic at 60, was thrilled about her progress as a beginner. While she might never do a handstand, her asana trajectory was ascending. In her context, she was going uphill, not downhill. Any arc must have a downslope, of course. In Haruki Murakami’s memoir What I Talk About When I Talk About Running, he muses about writing novels and running, both which he took up at 33. He ran many marathons, peaking in his late 40s. Approaching 60, he couldn’t sustain his former race times and mused on the futility of human effort: It’s like pouring water into a pot with a tiny hole at the bottom. Eventually the pot will run dry. Yet we strive to keep the water flowing, the pot full. 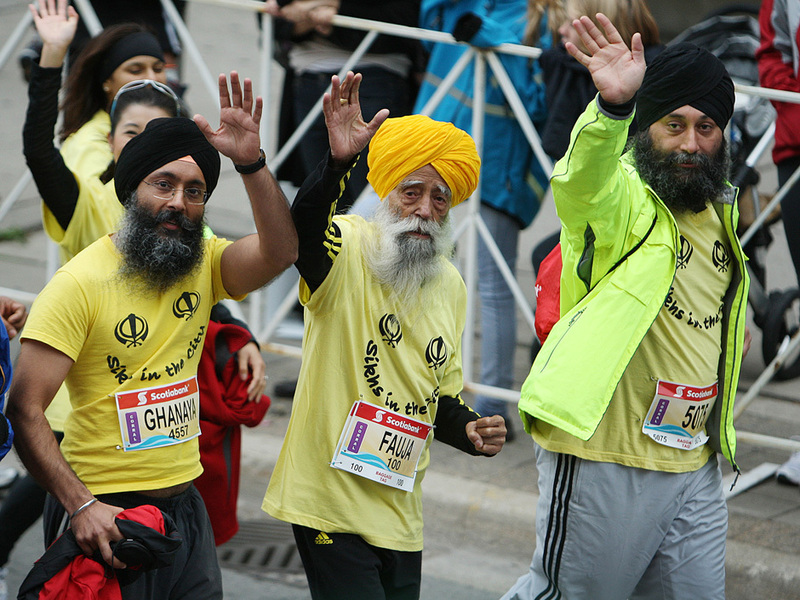 Singh went from unforeseen grief to running marathons, from his native India to “fantastic and different” London, in his 80s and 90s. Maybe there are “windows of time” for everything, but no rules about when they should occur. Enjoyed this article. I love both running and yoga. I have run 2 half marathons for leukemia and lymphoma research (team in training-I am a Hodgkin’s survivor) in my late 40’s (am 50 now) and don’t know if I will feel like ever doing a full marathon, but I do love to run and do a lot of brainstorming when I run. And yoga I think I will do for life, it keeps me younger and balanced (is there such a thing as balance? oh and pardon the pun!). I can’t do headstands and handstands yet, I need to focus on that! Thanks for a great article. Great post. Very inspiring. It’s easy to forget that you can always change and grow – it just may be easier at some points than others. Such an inspiring post. I have read about him in the news too. The first time I tried running, I almost give up because I can’t run for over a hundred meters without feeling tired and out of breath. But people around me inspired me to keep practicing. Thankfully I did! Now I can run 3 – 5 km while feeling fulfilled. Absolutely the validation anyone who says that they are too old to start exercising needs to read! Stunning – Mr Fauja Singh is an inspiration to all his fellow humans!